Robotics, AI, and basic IoT digitization is the technology that will be needed to design smart factories. Abundant data and smart robotics will magnify a factory's output, while minimizing costs and defects. 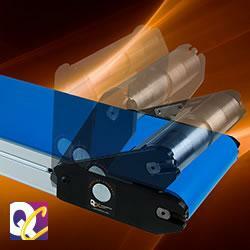 AS40 Conveyors are designed for ease of use and simple integration with robotic applications. Built on a rigid aluminum frame, they feature tee slots for rapid accessory mounting and a tail that flips up at the push of a button for easy under-belt cleaning and belt changes. Nosebar tails are available for transferring small parts between conveyors. All conveyors include a 10 Year Warranty and most are available with a fast five day lead time. CGI manufactures precision machined components and sub assemblies for custom applications. Our capabilities feature a careful blend of cutting edge technology and renowned reliability. With CGI you can count on us to provide the highest levels of manufacturing acumen and expertise while delivering it with the customer service you deserve. Our goal is to be the most trusted partner in your supply chain.